I am personally a neutral person, neither an optimist nor a pessimist. But the above photo explains so beautifully that optimism backed by hard work and a never say die attitude eventually pays rich dividends. 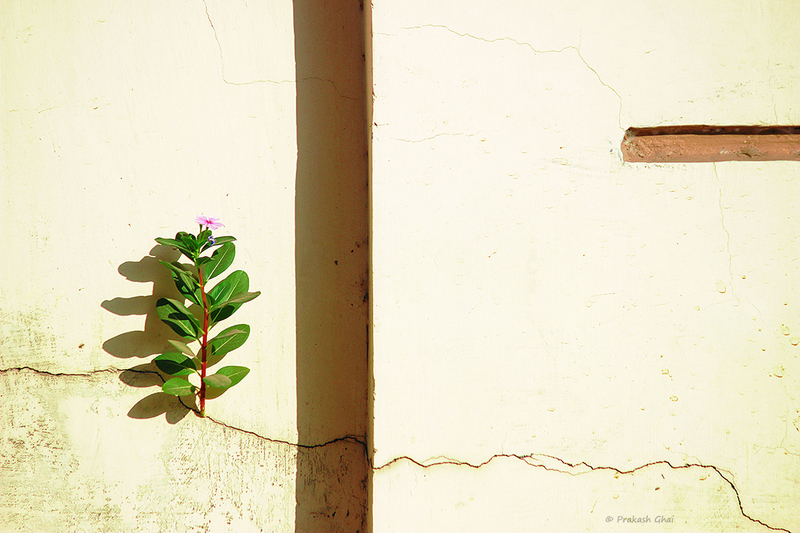 The plant above has managed to prosper within the crack of the wall and without proper soil to grow. And we keep complaining either of lack of resources or the lack of opportunity rather than focusing on our efforts. One day God, Luck or Randomness (depending on whatever you believe in) will come to you, but it should find you working in order for it to reward you. The mantra being "Work hard, but wait for your turn.". Patience is key. The photo falls under the Minimalism as Less Elements category. To shoot such shots in peak afternoon make sure you use exposure bracketing and do not forget to carry a water bottle to keep yourself hydrated. I bent down on my knees to bring the plant to a little close to the eye level and added a horizontal line on top right to balance the composition. Beautiful. I love the minimalist approach to all your photographs. Very inspiring.